New Orleans People were out in force in the Holy Angels meeting space in my neighborhood of Bywater in New Orleans. I got there ten minutes after the announced starting time, and it was standing room only. The convener said they had one-hundred explanatory packets laid out on table tops, but they clearly had run out of them by a long margin. What in the world would bring out such a crowd on an spring, Monday evening in the neighborhood? You might be able to guess, but I’ll give you the answer anyway: public housing is coming back! A big lot of about two acres in the neighborhood near the Mississippi River and only blocks from the Industrial Canal is owned by the Housing Authority of New Orleans (HANO) and has been for quite a while. Public housing had been there for years but like so much of public housing, the units were caught in the post-Katrina reconstruction of the city, despite the fact that in Bywater these units, like so many other public housing units did not flood. HANO had finally gotten its act together to make a proposal joined with a private developer as has become the fashion. 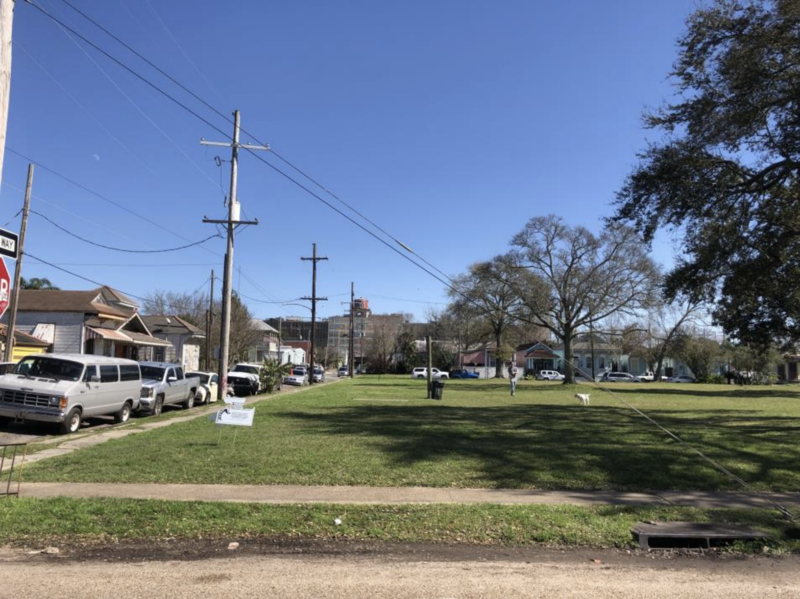 There would be 136 units with a 60-40 split of affordable one, two, and three-bedroom apartments, or 82 units that would be affordable compared to 54 units at market rents, which in Bywater have been soaring. A recent study by a local housing research group found that rents have increased throughout the city of New Orleans by 49% since 2000, while incomes have fallen by 8%. Yes, you heard that correctly, fallen by 8%. Bywater did not flood during Katrina since it sits on relatively high ground, being so close to the Mississippi River that the ground has been built up about eight feet or more thanks to the historic alluvial flood plain. Near downtown and the French Quarter with predominately what Orleanians call shotgun houses or others might see as duplexes, the neighborhood has become “hot” in real estate terms. Rents doubled after Katrina and housing prices per square foot have been steadily rising. In another hallmark of gentrification, in the decade since Katrina this previously working-class neighborhood went from being about one-third white to flipping where whites are now two-thirds and African-Americans, Latinos, and others are hanging onto a third. In short, the city and neighborhood desperately need affordable rental units! We needed the entire project to be affordable in fact. Instead, one of the small neighborhood groups has been hollering that it wanted the split to reverse so that at most only 56 units would be affordable with the whole size of the project reduced. The former industrial area and project they claimed was now going to be too tall at four stories, even though the former F. Edward Herbert federal complex towers over that area only blocks away as do the cruise ships docked nearby. They also argued that they wanted more green space, even though that section of the neighborhood is only a few blocks from the relatively new and completely underutilized Crescent Park running along the river, making it obvious that their arguments were specious. The Planning Commission recommended approval, and though the local council person had seemed to be wavering in the face of this small minority of neighbors, at the hearing she seemed to have a stiffer backbone. The meeting was billed by the television newscasters as neighbors protesting, but in fact the meeting was a full-throated explanation and defense of the project. There is still a Council vote to come, but at this point the last gasp hope of the anti’s for a zoning defense seems nothing more than a mask for their real feelings, even though for the rest of us it is hard to feel happy on the verge of a win when it is such a half-loaf compared to what is needed to maintain diversity of class and race against the gentry’s rising tide. New Orleans ACORN has been in the headlines in the United Kingdom recently heralding the end of something called Section 21. It’s worth understanding fully, because this is a huge win for tenants and spells the end for so-called “no-fault” evictions which were poison for private renters and candy for the landlords. “The government will consult on abolishing section 21 evictions in England, meaning private landlords would no longer be able to evict tenants from their homes at short notice and without good reason. Currently landlords have the right to get rid of tenants with as little as eight weeks notice after a fixed-term contract has ended. The government said that section 21, which is notoriously hard to challenge, had become one of the leading causes of family homelessness. Prime Minister Theresa May took a break from the Brexit disaster to announce the consultation as she tried to respond to the housing crisis for tenants in the country and shore up her declining support and seeming disinterest in domestic affairs. Next step for ACORN is pushing the consultations to a quick conclusion. The organization is beefing up its ability to handle section 8 evictions when they come with a recently added “defense coordinator” in the main Bristol headquarters. Under the proposals, landlords seeking to evict tenants would have to use the section 8 process, which can be implemented when a tenant has fallen into rent arrears, has been involved in criminal or antisocial behaviour or has broken terms of the rent agreement, such as damaging the property. Ministers have said they will amend the section eight process to allow it to be used by landlords if they want to sell the property or move back in themselves. Unlike section 21, tenants can challenge section eight evictions in court. 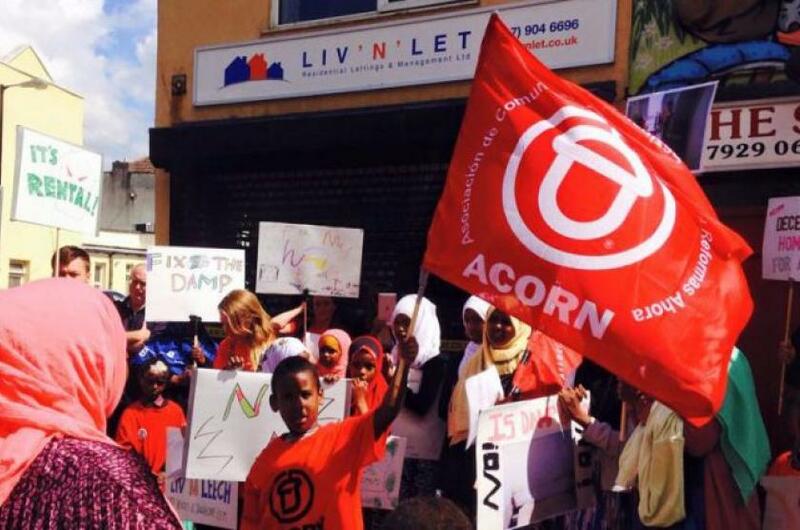 This victory doesn’t end the war, just changes the battleground for ACORN, so that at least we will be fighting on more even ground for tenants.